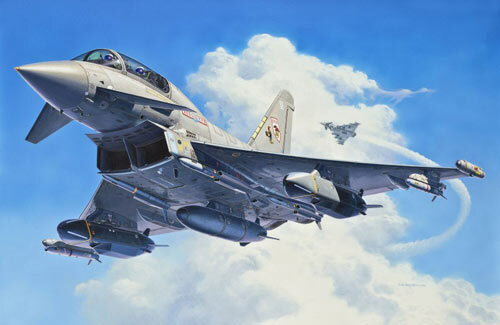 All Products > "04689 Revell 1/48 Eurofighter Kit"
As well as its classic role as a twin-seat training aircraft, in future two seater Eurofighters will also be equipped for the Fighter-Bomber role. The Eurofighter is the most up-to-date multi-role combat aircraft in the world. No other next generation combat aircraft programme of can claim to have received a greater volume of orders. The Eurofighter Typhoon is extremely agile and manoeuvrable. It is specifically designed to meet the Air Defence requirements of the partner nations and will possess an outstanding air-to-surface capability. The Eurofighter is the most advanced combat aircraft developed in Europe and is the product of a joint programme between the German and Spanish EADS Company, BAE Systems of Great Britain and Alenia Aeronautica of Italy. This, the most modern combat aircraft of its class combines innovative and advanced technology and boasts impressive versatility. Perfected for the air superiority role in both long and short range combat, the Eurofighter also has an extensive capability in the ground attack, reconnaissance and maritime attackroles. Equipped with the latest generation guided missiles, the Eurofighter has an outstanding weapons arsenal. Similar to the F-15 Strike Eagle, a Weapons Systems Officer will assist the pilot during his mission (in reality the EF has been designed to be full combat ready in all roles as a single seater, exactly to avouid to have another crew member like the F-15 or the Tornado) The second crew member could be useful for the SEAD roles (Suppression of Enemy Air Defence). This crew composition has already been successfully employed within the Royal Air Force (in reality the RAF fighter bomber unit is composed by sigle seaters). Since September 2003, most of the Royal Air Force's "Twin-Seater's"have been concentrated at No. 29 (R) Squadron, the Operational Conversion Unit (OCU) at RAF Conningsby. The OCU is responsible for the complete technical and tactical training of Eurofighter Pilots within the Royal Air Force.